It was forecast snow for Friday morning all last week. I told the kids it’d be a snow day. It started falling Thursday evening – Ella’s birthday. It fell and it fell. I was up predictably in the dark. The hairdresser’s lights were on at the end of St James’s Street. So, I set up a 16 x 20 canvas in the falling snow and wind returning to the van to dry the canvas every twenty minutes. (I left the engine running all day – sorry environment!) There’s a weird effect when you are trying to move ice around the canvas to make the paint stick. It’s very soft. I then painted on board under the tailgate which gave limited cover. The snow was settling on the road more as the morning went on. Thank you to Diana Bourdon-Smith for the hot sweet coffee and biccies! Then was the end of Bennet Street and a view to the Abbey. If you have the Bath calendar – it’s similar to the view from Feb. I had a social media whinge as a van parked in front and I had to abandon the 20 x 16 and move back 5 yards where I worked on a 20 x 25 again under the tailgate as the snow was still heavily falling. At around 5pm I tried a little sketch from Belmont looking towards the circus in the twilight . . . very sketchy. 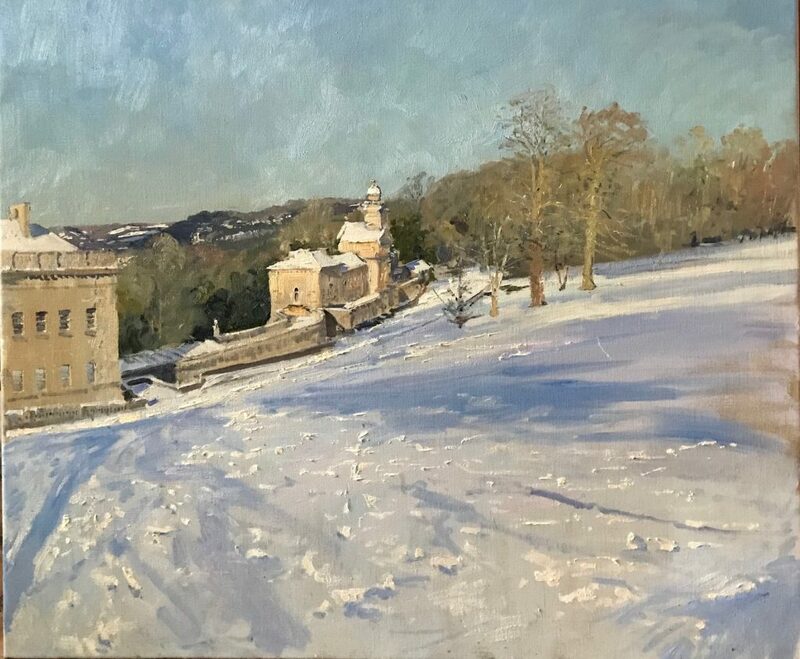 And then Saturday, after an icy night, it was bright sun on snow: Royal Crescent, Marlborough Lane and then up to Prior Park where the snow lay up to my knees on the bank. After a boozy Saturday night, a thick-headed Pete returned to tickle up the Royal Crescent painting before going up to Rainbow Wood where I spent the rest of the day painting the view from there over the city. Feeling guilty witnessing families sledging together, at 3.30pm, Lisa dropped Ned up with two sledges which is why we both woke up black and blue. The snowball in my ear has melted now though. Was a good three days. They’ll be fodder for my next Bath show in November to accompany the ‘Beast from the East’ ones from last year. View my gallery of snow paintings from past years.